Neagley & Chase Construction Co. in South Burlington, Vt. "Because of its supreme technical advantage over conventional glass, it is more expensive than normal glazing, making it limited to specific applications," he says. "We used it at a fine art gallery, and I see tremendous value at that location, because the building would not accommodate any other type of system that provides tinting for their artwork. It is too expensive to use a common storefront, but for areas that require variable degrees of light penetration it is almost priceless." Shenk has worked on one dynamic glazing project: The St. Johnsbury Athenaeum in St. Johnsbury, Vt. "This is my first project using this glass, and prior to the project I had never heard of it," he says. "The product was selected prior to me being involved, and I was not part of the design team." Dynamic glazing is relatively new technology, says Randall Vaughn, director of architecture for Gray Construction in Lexington, Ky., and builders question the durability and long-term sustainability of the product. They want to know if "the glazing subcontractor trade is comfortable with dynamic glazing installation and maintenance of dynamic glazing systems," he says. Shenk echoes Vaughn and says that he is still unclear about the life expectancy of dynamic glazing. 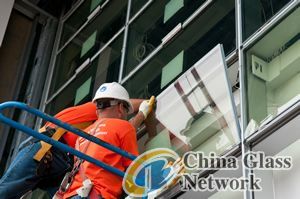 "This process is relatively new, and I would be hesitant to install this glass on a project that I personally fund, because I am unsure how long the system would stay operational," he says. "Having no idea how the glass actually 'operates,' it would be hard for me to predict the longevity, but I would like to think it would last my lifetime."